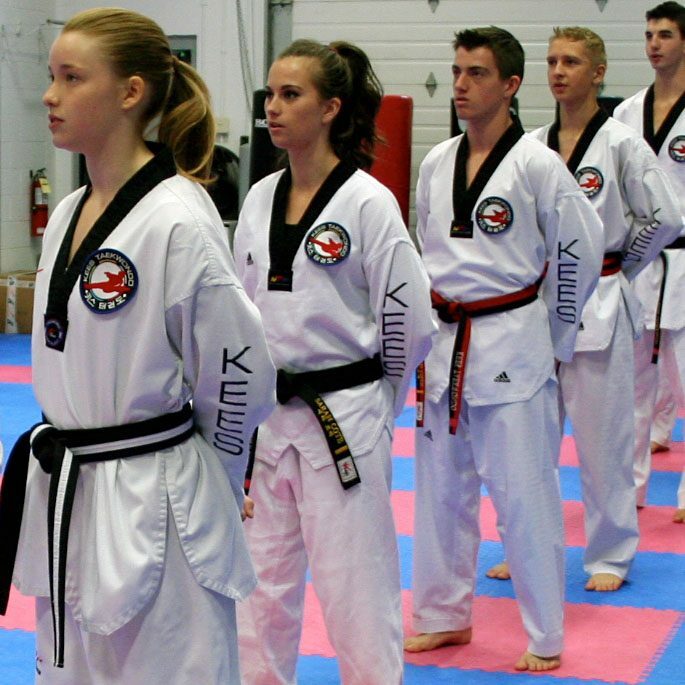 Teens find Kees Tae Kwon Do an exciting, challenging, fun and friendly place to be. They are valued, respected and truly liked. Kees Teens participate in the same classes as adults. In addition to learning excellent martial arts skills, teens are encouraged to participate in programs that develop their personal interests and talents. Two such programs are the Kees Leadership Programs and the Kees Competition Teams. Kees Leadership Programs teach skills that are highly valuable and transferable into other school and work environments. Kees Competition Teams learn Olympic Style Taekwondo from some of the best coaches in Canada. Wherever their talents and interests, Kees Teens are supported to achieve well in school and in other positive pursuits. The life skills of cooperation, respect and self-discipline they learn at Kees help them meet the challenges that come with being a teenager. Kees Teens are encouraged to make positive choices that will serve them for a lifetime. They certainly make great friends and have fun.